Bristol survived a first-half scare from Rotherham to take a 12-point advantage into the second leg of their Championship play-off semi-final. Ben Morris's try, added to seven points from Tom Barrett, gave the Titans a 10-8 lead at the break, after Jack Lam's try and Gavin Henson's penalty. Jamie Broadley added to the lead but Bristol fought back with further scores from David Lemi and Charlie Amesbury. A late penalty try could prove crucial for the hosts in the return leg. 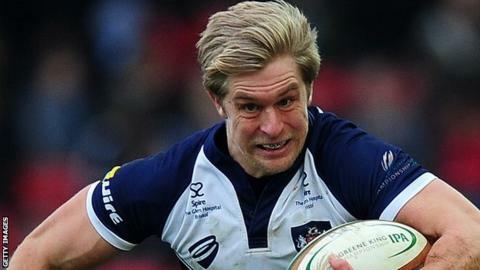 Worcester were given a similar fright by London Scottish in their semi-final first-leg, before running out 27-22 winners. Andy Robinson's Bristol topped the Championship table at the end of the regular season, as they did last season, before losing to London Welsh in the play-off final. The second leg is this Sunday (10 May, 13:45 BST). Bristol: Wallace; Amesbury, Maule, Henson, Lemi; Morgan, Peel; Traynor, McMillan, Cortes, Townson, Sorenson, Jones, Lam, Eadie. Replacements: Brooker, Perenise, Glynn, Mama, Kessell, Robinson, Tovey. Rotherham Titans: Scanlon; Broadley, Hayes, J. Davies, Keating; Barrett, A. Davies; Hislop, Cruse, Tampin, Maddison, Robinson, Rieder, Birch, Morris. Replacements: Preece, Williams, Thiede, Thomas, Argyle, White, Wilson.